DELANO — Merrill Pavlovich has never been one to promote statistics or personal achievements. 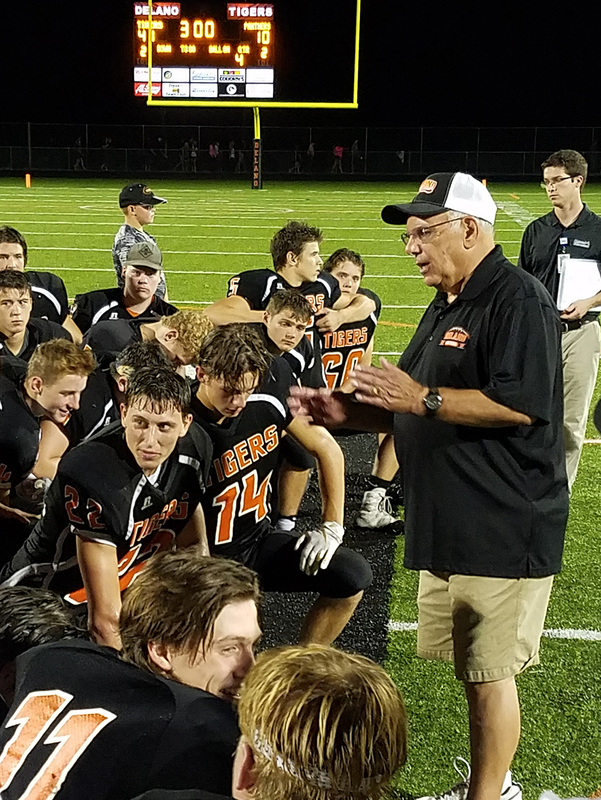 Delano’s 43-year head coach stayed true to his own self Friday night following the Tigers’ 41-10 home win over Glencoe-Silver Lake, a win that happened to be the 300th in Pavlovich’s career. Coach Merrill Pavlovich addresses his players following Delano’s 41-10 win over Glencoe-Silver Lake Friday night at Tiger Stadium. The win was Pavlovich’s 300th in 43 seasons with the Tigers. Those kids appreciate what Pavlovich has done for each one of them and for those who came before them, as well. The win moved Delano to 2-1 for the season and improved Pavlovich’s career record to 300-141. He ranks sixth all-time in Minnesota coaching wins. Friday night, the Tigers took what Pavlovich and his coaching staff gave them during the week and played it to perfection against a Glencoe-Silver Lake team that entered with a 2-0 record. Those challenges included controlling the line of scrimmage, which the Tigers did; limiting Panthers quarterback Korey Johnson, which they did; and taking care of the football, which they did. Up front, Delano’s offensive line allowed Otto to throw for 209 yards and three touchdowns and the backs, including Otto, to run for 190 yards and three touchdowns. Otto’s three touchdown passes came in the first half, when he threw for 155 yards. Two of those strikes went to Reno Bredahl. Otto and Bredahl punctuated Delano’s first drive of the game with a 20-yard touchdown connection. The two made a defensive back look silly in the second quarter, when Otto pump-faked and found Bredahl wide open on the left sideline for a 53-yard catch and run. That long touchdown strike came on the first play from scrimmage after Delano linebacker Adam Brown jumped on the loose football on a Panthers’ fumble. Otto’s third touchdown pass of the first half went to Trey Longstreet on a fade to the back of the end zone with less than two minutes to play. Targeting Longstreet for the touchdown was a reward for the interception Longstreet came up with to set up the possession. In between Bredahl’s two touchdown catches, Sam Kern and the Tigers’ running game found the end zone. Kern capped an 11-play drive that bridged the first and second quarters with a four-yard touchdown run up the middle. George Horobin was good on three of four extra point kicks (the other was blocked). He was good on two extra-point kicks in the second half. Delano took a 27-3 lead into halftime after running just 25 offensive plays. The Tigers were well-balanced, running 13 times and throwing the ball 12 times. As for taming Johnson, Delano held the senior quarterback to 25 yards rushing and 42 yards passing. As for taking care of the football, Delano did not turn the ball over in the game. The Tigers forced three turnovers — the fumble recovered by Brown, the Longstreet interception, and a late fourth-quarter fumble recovered by Matt Baker. The Tigers kept the pedal down at the start of the second half, going to the air on the first play. Otto found Brett Unrein for a 36-yard gain, and the march toward the end zone was on. On the 11th play, Otto snuck the ball across the goal line for a one-yard touchdown run. Horobin’s kick made it 34-3. Glencoe-Silver Lake answered right back with its only touchdown. Will Higgins busted through the line and sprinted for a 36-yard touchdown run. Damien Silus kicked the extra point through to make it a 34-10 game with two minutes to play in the third quarter. In the first quarter, Silus put the Panthers on the board with a 24-yard field goal. At the time, the three points made it a 7-3 game. Caden Link scored the game’s final touchdown on a two-yard run with two minutes remaining in the game. Horobin kicked the extra-point through. Three plays before the touchdown run, Like set up the Tigers inside the 10-yard line with a 68 yard run.